I was innocent when I made ‘Maqbool’. I had little knowledge on various aspects of filmmaking. 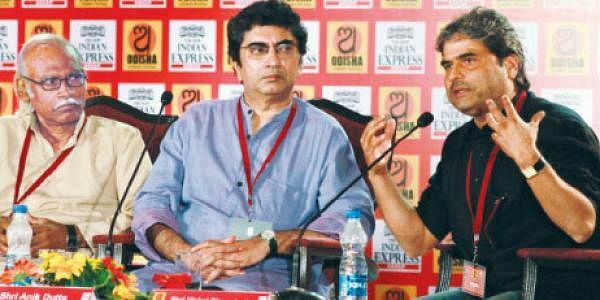 Speaking on the second day of the Odisha Literary Festival on ‘The difference between writing books and writing for a visual medium’ ace filmmaker Vishal Bharadwaj said “I made changes in almost every part of the movie, an adaptation of Shakespeare’s Macbeth. When it went to the Toronto Film Festival, people questioned me on these changes. Thankfully, they appreciated the movie. Had they not, my career could have come to an end then,” Bharadwaj said. “Before my first film ‘Makdee’, I had made two short films for which I had written the script. It was then that I realised how bad I was at writing scripts. So I started looking for books because I realised writing for movies was nothing less than a craft,” the seven-film-old Bharadwaj added while recalling his initial days as a screenplay writer. Echoing similar sentiments was popular Odia filmmaker Nirad Mohapatra. “These are two different forms of writing and stand no comparison, for the simple reason that the book is a finished product and the screenplay, all said and done, is only intermediate stage, a blueprint which has no independent existence,” said Mohapatra. Compared to cinema, he said, literature operates at a different level. “Each reader forms his own corresponding image of the characters and settings and views it with a mental filter entirely of his own. It is through his active mediation that the literary work comes alive. Cinema, on the other hand, operates through concrete images and sounds and has a tendency to encourage passivity. Though, like literature cinema too, employs the same elements such as plot, character, settings, dialogue and also shares its tendency to manipulate time and space, the experience of the two are very different. The root difference, some believe, is that in cinema, one extracts the thought from the image and in literature, the image from a thought,” added Mohapatra, whose debut film ‘Maya Miriga’ was declared the second best feature film in 1984 at the national level. The filmmaker said the first commandment of screenplay writing is to think visually. He further said nothing that can be seen or heard, that is, nothing that cannot be captured by the camera or the sound recorder should get into a script. “Grandiloquence is a no-no in films. No metaphors, similes, poetry, or mellifluousness. In other words, no artistry,” he said, adding that this makes screen-writing far more of a craft than an art. Speaking on the occasion, Anik Dutta, maker of Bengali film ‘Bhooter Bhabisyat’ which was widely appreciated, recalled his journey from writing for ad films to script-writing for his debut movie. “I had no budget for hiring a scriptwriter, so then I had to do it myself. Only then I realised how difficult the job was,” he quipped.